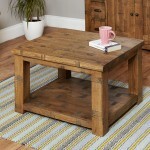 At 121 Home Furniture, we have a wide selection of gorgeous coffee tables, supplied by some of the leading manufacturers of Home Furniture in the UK - Julian Bowen and Baumhaus. 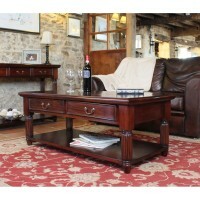 Within our extensive range of Coffee Tables, you'll find numerous different sizes and finishes such as oak coffee table, glass coffee table, white coffee table, metal coffee table, nest of coffee tables, coffee table with drawers, coffee table storage trunk, open coffee tables and many more. 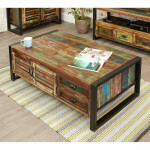 Whatever style or colour of coffee table you're looking for, hopefully we'll have something that meets your needs and matches your decor. 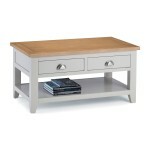 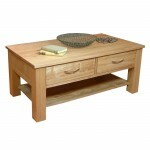 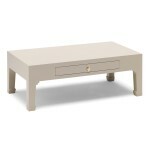 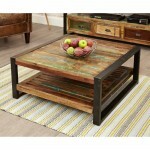 Our gorgeous coffee tables are the ideal living room furniture or conservatory furniture piece. 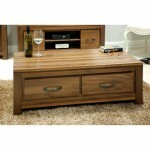 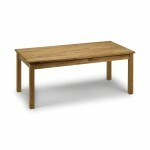 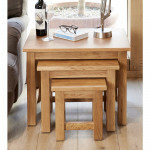 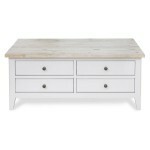 If you're looking for an entire range of matching furniture, please have a look at our Home Furniture Ranges section. 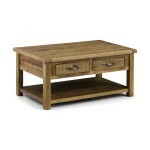 Julian Bowen Brooklyn Nesting Oak Coffee Tables BRO004 Crafted from solid oak, these nesting coffee tables offer a rustic finish emphasising the stunning natural wood grain. 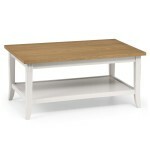 The Brooklyn Nesting Coff..
Julian Bowen Davenport Coffee Table DAV007 in Ivory	Crafted from solid rubberwood and a real oiled oak veneer 2.5cm thick topElegant and durable ivory lacquered finishDelicately shaped legs complement..
Coffee Tables - Industrial Style Oak Coffee Table 5420275 Industrial style coffee table Warm charter oak effect finish Sharp, minimalist design in charter oak effect Finished on all sides for versati..
Julian Bowen Astoria Coffee Table AST003 Astoria Coffee table with 2 drawers Supplied Fully Assembled! 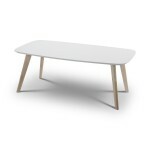 Width: 100cm Depth: 60cm Height: 50cm ..
Julian Bowen Metro Coffee Table MET001 in White Metro Coffee table in a White Hi Gloss Finish A modern high gloss coffee table in white lacquered finish with extra shelf. 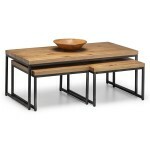 The clean lines and..
Julian Bowen Metro Coffee Table MET003 in Black Metro Coffee table in a Black Hi Gloss Finish A modern high gloss coffee table in black lacquered finish with extra shelf. 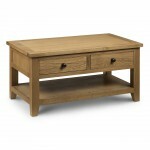 The clean ..
Baumhaus La Roque Mahogany Coffee Table With Drawers IMR08A Hand crafted from solid Mahogany Finished to exceptional standards using a mid gloss lacquer, offering durability whilst maintaining the n..
Baumhaus Mayan Solid Walnut Four Drawer Coffee Table CWC08B Superb large 4 drawer walnut coffee table Constructed using solid walnut Walnut is a very high quality timber with a dense grain, t..
Baumhaus Mayan Solid Walnut Open Coffee Table CWC08C Superb open walnut coffee table Constructed using solid walnut Walnut is a very high quality timber with a dense grain, this makes it the ..
Baumhaus Mobel Solid Oak Four Drawer Coffee Table COR08D Contemporary four drawer coffee table Four large drawers provide useful storage Large open shelf ideal for magazines..
Baumhaus Mobel Solid Oak Nest of 3 Coffee Tables COR08A A nest of tables with a superb contemporary design by Baumhaus Crafted from the highest grade, selected solid oak Exceptional..
Baumhaus Shiro Walnut Coffee Table CDR08B Superb medium walnut coffee table Constructed using the highest grade of solid walnut Walnut is a very high quality timber with a dense grain, this makes it..
Baumhaus Shiro Walnut Four Drawer Coffee Table CDR08C Superb walnut coffee table with four drawers Constructed using the highest grade of solid walnut Walnut is a very high quality timber with a..
Baumhaus Shiro Walnut Nest of 3 Coffee Tables CDR08A Superb walnut nest of three coffee tables Constructed using the highest grade of solid walnut Walnut is a very high quality timber with a den..
Coffee Table Baumhaus Heyford Rough Sawn Oak CRS08C	A simply stylish coffee table with a shelf to house your magazines, remote controls etcCarefully crafted using rough sawn oak and hardwood panelsThe..
Coffee Table PCO08A - The Nine Schools Qing Oyster Grey by Baumhaus A superb Chinese coffee table in oyster grey The beautiful satin finish is complimented by antiqued white copper metal work..
Coffee Tables - Richmond 2 Drawer Coffee Table RIC203 Richmond Two-Tone Coffee Table An elegant Coffee Table, presented in an immaculate painted, soft Elephant Grey finish with beautiful pal..
Julian Bowen Richmond 2 Drawer Coffee Table RIC603 in Blue and Oak2 full depth drawers that can be accessed from both sides of the table offers ample amounts of storageChic cupped handles in a brushed..
Coffee Tables - Roscoe Oak Coffee Table CNS08A by Baumhaus A gorgeous contemporary solid oak coffee table Crafted from solid oak and with a lovely, eye-catching design, the Roscoe range will add t..
Coffee Tables - Signature Grey Coffee Table CFF08A by Baumhaus This wonderfully versatile coffee table has four drawers on one side and a flip-top storage space on the other side The key feature t..
Coffee Tables - Urban Chic Large Coffee Table IRF08B by Baumhaus Unique contemporary large coffee table This unique piece consists of 2 cupboards and 4 drawers The internal dimensions of the cupbo..
Coffee Tables - Urban Chic Rectangular Coffee Table IRF08D by Baumhaus Unique contemporary large rectangular coffee table The exclusive Urban Chic range is made using reclaimed wood salvaged from..
Coffee Tables - Urban Chic Square Coffee Table IRF08C by Baumhaus Unique contemporary square coffee table The exclusive Urban Chic range is made using reclaimed wood salvaged from places such as Guj..
Julian Bowen Aspen Coffee Table ASP004 Solid Pine Coffee Table with 2 DrawersConstructed using Rough Sawn Solid Pine, the Aspen Coffee Table features a Handy Storage Shelf suitable for the Aspen B..
Julian Bowen Astoria Nest of Tables AST005 Nest of 2 small tables Supplied Fully Assembled! 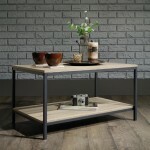 Width: 56cm Depth: 38cm Height: 50cm ..
Julian Bowen Casa Coffee Table CAS103 Retro Designed Casa Coffee Table A timeless retro design reflecting the style of the 1950's. 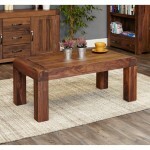 The Casa coffee table has a durable white lacquered top wi..
Julian Bowen Coxmoor Coffee Table COX005 Solid Oak Coxmoor Coffee Table Solid American White Oak finished with a Rich Oil, giving a sophisicated, contemporary look. 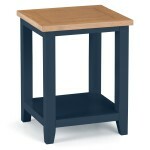 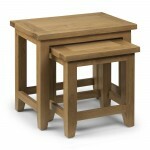 Width: 120cm..
Julian Bowen Richmond Lamp Table RIC604 in Blue and Oak Features a handle shelf, providing extra storage space. 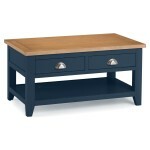 Presented in an immaculate painted, Midnight Blue finish with beautiful pale oak top, .. 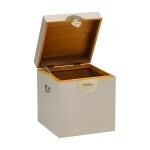 Storage Trunk PCO08B - The Nine Schools Qing Oyster Grey by Baumhaus A charming Chinese trunk in oyster grey The beautiful satin finish is complimented by antiqued white copper metal work Can..